Tim Parkin (Tim): <to Julian> A lot of your work, when you first started personal projects, was based in Scotland and you made almost pilgrimages to various parts. Was that inspired by some of the work in First Light? Tim: You didn’t have much luck with the weather when you went up to look for these pictures? Julian: That’s right, but it’s when the penny dropped. I was trying to capture big vistas, and failing, and it wasn’t until the bad weather came in and I learnt how to deal with that and capture it that I got excited. It felt like I was doing something, not necessarily unique, but that felt personal. That was the point at which it felt like personal work. Tim: That’s when the sense of the sublime came in that you talk about Joe? Joe Cornish (Joe): Exactly, the feeling that you get in your pictures, if that’s the threshold that you cross when you realise that you could work with the weather rather than fighting against it. One more thing I wanted to say in response what Julian said was about crafting pictures. I worked as an assistant with car photographers quite a bit and I subsequently started to think about the landscape a giant still life. When you do that you can’t control the lighting but you can at least conceptualise about the colour relationships and the form and the way modelling works, because of that knowledge from the studio. Julian: And it was high tide wasn't it? I saw someone commented once on that picture. They said “wow how did he do that because when I was there the water wasn’t there!” That did make me chuckle! Planning and patience. Patience is important. Joe: Persistence too. I’m not a very patient person and I remember talking to Paul Wakefield about that once. He said “I’m very impatient person” but when you look at his pictures you think, how on earth did he do that! So it’s not so much about hanging around but being prepared to go back and back. Being able to use your time constructively when you are waiting for something to happen. As you need to be able to keep that energy in check and let it flow when you need it to. Tim: I think it would be safe to say that you lead a bit of a renaissance in large format camera usage in the UK. I know a lot of people who took up large format camera after seeing your's and David Ward’s book. Was this the case for you Baxter? How long had you worked with large format? Baxter Bradford (Baxter): I had been on a course with Joe in 2001 and I was making my first foray into large format then. I was having a conversation with Paul Saunders last summer and we both made this confession. I feel like a bit of a saddoe as when I went through the book I did a done a tally of the Lee filters Joe had used! The ones with the most ticks against them, I went to Lee Filters and bought! I couldn’t afford all of them but it gave me a pecking order, so when I got a bit more money, I got more. Paul said that was exactly what he’d done. This moment that we had this discussion for the first time. I was getting misses as well as the occasional fluke. The book was seminal in that it shows a nearly right photograph as well as the one that worked. They talk about and self-criticise, and there is the narrative about the background to the image as well. The fact, like you said Julian, the lighting is there, but it’s a case of how can you solve problems so you can identify the answers when you’re out in the landscape. You might have gone with the idea of doing this but the light is doing something different, so I should concentrate on doing that. The variety of landscapes in the book and the picture styles. It helped give me self-confidence to solve the problems such as this isn’t quite right because ……. And this is better because….In hindsight, I would have done this... I thought that was very open and gave me a lot of footholds on my own journey to improve. Tim: Whose idea was that in the book Joe? Joe: Very interesting in the way Bax has put that as it reminds me that although the idea for the book was principally Eddie Ephraum’s - the content was inspired largely by my reading of Galen Rowell’s Mountain Light. Anybody got that? Very important work in photography I think. Of all the books that I’d ever read up to that point, that was the first one that revealed the craft process. Tim: Pulled the curtains back on the process…. Joe: Yes. Galen was extremely good and generous with his explanations for how he’d analyse the way lighting worked. He was very scientific in his approach to problem-solving and that was a revelation to me! That was a good way to go and a generosity of spirit that I liked too. When I was an assistant in London, I don’t know if this will resonate for Julian or not, nobody would tell you anything! Joe: Everything was secretive because every photographer was afraid. Julian: Paranoid of the next guy? Joe: Yes, of the next assistant pinching their clients basically! There were no workshops back then either so you had to go out and learn everything by taking pictures and making very expensive mistakes. They were expensive because of the cost of film and processing. It was a different way of learning for sure then. Mountain Light and Galen should have been referenced more strongly in that last chapter. I’m hoping to make up for that here. Thank you for that. Tim: Matt, you’ve only just recently got into photography is that right? Matt Lethbridge (Matt): Within the last ten years and pretty much as a direct result of stumbling across Joe’s book in a bookstore. I was the same as a lot of people, I had a little compact camera and took it on holiday and made some nice pictures. You come back from holiday and would be disappointed with the results. I was wandering around a bookshop in our local town, just trying to kill time and came around this remarkable picture on a book cover, the picture of Elgol, and I was just amazed and picked up the book, opened it up and had a flick through. I was even more amazed at the pictures at that time, bearing in mind I had no photographic experience. We’re all used to National Geographic Magazine images with these wonderful pictures of exotic far off places. But this bloke called Joe Cornish, he photographed all of these photos in the UK more or less. To see Elgol in Scotland and see it lit, and the depth of beauty in the picture, it astounded me. It moved me to purchase the book and got it home. I read through it and again, and it sparked something inside me and made me want to go out and make pictures. I went out and bought a proper camera with interchangeable lens and failed miserably. I devoured magazine after magazine but kept going back and referencing the book. Joe: You must have a very patient other half, I’m sure! Matt: I have a very patient wife, she’s wonderful. This inspiration from First Light has just carried on and the book is there at home and is a constant reference to me. Whenever I feel I need some inspiration I pick up the book and look through it. I read a few passages and look at the ‘nearly photos’ and think perhaps one day I’ll make a photo as good as them! Tim: Do you think that it’s the narrative as well as the pictures that are important for your appreciation? Matt: Incredibly important because, although the picture speaks volumes itself, it is also the thought processes. I felt I needed to understand why Joe took that particular picture, how he produced it, how was he feeling. It’s been profound actually. Without the book, I wouldn’t be a photographer and I wouldn’t be sat here today. Tim: Beata, you have a very different style of photography now. Tell me about how you went from discovering Joe’s book and your style. Beata Moore (Beata): I went for a workshop with Joe a couple of years before the book was published. As a result of the workshop, the very first thing I did was to buy a wide angle lens. I thought that’s it, I’m done, I know what I’m doing! I didn’t and luckily a couple of years later your book came out. I read it a lot and I understood more but I still couldn’t quite grasp, as wonderful as the wide vistas are, I just didn’t feel them. I couldn’t portray what I felt and what I wanted to portray. It took me longer to understand that actually, my heart lies in smaller views, more intimate details. I think some of my images border with abstract and I still love colour on top of everything else. I think abstracts and a little bit more nature details are more me. As much as I’d like to be Joe Cornish, I’m not! For the last few years, I work more and more towards his more intimate views. I learnt so much from Joe. It’s his approach, that slow approach, less of a galloping photographer like I tend to be sometimes as I get fascinated with what’s in front of me. Joe has a more meticulous approach which I have witnessed and I took that into consideration and I slowed down much more. Although I still get distracted a lot by light, changing moods and reflections and whatever else! I have learnt a lot and think I’m kind of semi-comfortable with what I’m doing with my little nature details. Tim: Harvey, how did you discover the book? Harvey Lloyd-Thomas (Harvey): Around the time when I was asked to take part in this exhibition, I was trying to think back to when I became aware of Joe’s work. It was so long ago I can’t remember! I first got into photography at university when I was hill walking in places like Scotland and the Lake District. I was just taking photographers of the walks and the outdoors. My love is being outdoors, that’s what I enjoy and have an interest in the arts and design from when I was a child as I did lots of painting and drawing. The photography started as a means of recording my hill walking expeditions and around that time I came across Colin Prior books and became aware of Joe’s work. There was a big disconnect between the pictures I was taking and the pictures I saw in these books. That’s when reading Joe’s book and his explanations of how these pictures were taken made me realise that there’s a whole extra new level of craft, patience and attention to detail that I wasn’t taking myself. It started from there and I became more serious about the photography and although I think it’s still being outdoors is the number one thing for me, making the image is number two and I get enjoyment out of both and that’s why I take photographs outdoors rather than other styles of photography. I still have a conflict in that I have a spontaneous approach to my photography quite often and most of the time I don’t use tripods or filters. I’m aware of deficiencies when I come back with images that I then realise they could have been improved if I’d paid attention to detail that people like Joe do. I’m still trying to slow down and perhaps take that extra care and not always succeeding with images I like as much as when I take the spontaneous approach. Joe: That’s a very interesting point you identified there I think. That remains a big challenge for everyone that you’re ideas are truly your own voice and you often see those and make phone based snapshots. A few of us here will have that experience and the phone pictures look fantastic and you think I’ll set up my camera and you get your big camera out and you often when you get those pictures back they don’t have quite the same something. So that perhaps some of what was there in the original idea and perhaps it’s how the phone translates it. Perhaps the colour and the light have changed, but sometimes it’s because you’ve laboured over it and it’s hard to get that feeling of something that is crafted and stilled and retains the spontaneity of the idea. That’s no easy job. Harvey: I think I perhaps just accept that’s my style, that spontaneous approach and it’s not going to be technically perfect as a result. I think also my approach took a while to work out this problem of exposing sky and landscape equally until I discovered graduated filters. Until that point, I was just not achieving results in my pictures that I was seeing in magazines and books. My approach was quite often to come up with compositions that ignored the sky and I think that partly lead me, like Beata. I'm not necessarily attached to representation like the pictures are on the wall in the gallery. A lot of my pictures are more abstracts and details of intimate landscapes. Extracts, I think people describe them as, and that partly started from the technical limitations of how I was taking pictures. I’m still drawn to that but I have this other conflict that I take a lot of my photography when I go away to Iceland, Scandinavia and places like that. I go to these places and come back with pictures of details which could have been taken anywhere. I do want to take vistas and I do occasionally succeed but I’m more successful in the smaller work. Tim: This is an example of the difference between inspiration and influence isn’t it? Because I can look at many different styles of photography and be inspired by them but not want to produce the same style of work or look. It’s a difference between what you see as well. Joe: Yes, if only it was possible to fully understand when that changes. We all want to develop our own voice as artists, I think that must be true, and in order to get to that point or place, you do have to go through something that appears to be plagiarism. I’m sure that most people will understand that and after all you go to any art gallery on any day of the week, anywhere in the world and you’ll find art students copying paintings. This is a well-established process, trying to study and understand the work of master painters or photographers in order to build. There’s a famous quote of Picasso’s which I never really understood until David Ward made it clear to me the reasoning. Picasso said that “all artists borrow, great artists steal!” Which I thought was an interesting distinction and I have always been baffled by that. What it means is that when you steal something you now own it. That’s the difference. Tim: It becomes part of you? Joe: Yes, in some ways it’s better I suppose to draw the lessons that you learn from the work of others and incorporate it into your own approach as far as you can. Rather than looking at the superficial impression of a picture and go back to try and copy that particular idea. That’s easy to say and not easy to do. Tim: I remember Charlotte and I went on holiday to Elgol about eight years ago and I sat on the beach there, having a relax and had to guide five people to a particular boulder! I was like a guide or tour operator. It got to the point by the fifth person came and before they even said anything I said: “It’s over there!”. I do think that there’s a certain problem, there are a lot of people who when they are doing art or photography, can develop a mental model of what a picture looks like. That internal model is related to your exposure to other photographers or artists work. If you have only ever had one influence, that mental model will always look like that influence. I think that this is part of what Picasso was referring to. If you’re going to take influences, take them from lots of different areas and, as you say Joe, don't just take the representation, take the whole work of the artist. Then you become the sum of everything you’ve seen and hopefully that includes your own work too. It’s that which becomes the essence of yourself - a composite of influence and self creation. Joe: I think that successful artists, what they do is translate themselves very accurately or directly into their work. That has a curious way of becoming the universal. There’s a very famous quote by an artist and which Charles Cramer included in his talk at the On Landscape Meeting of Mind Conference. The summary of which is that "art is not a popularity contest" or a technique contest or any contest. The contest is actually with yourself; to connect with what you really are and feel. You hear that in music particularly, and I don’t want to go too far off track but if we briefly look at the analogies between photography and the other arts, I think that music is often the most fascinating because it’s a two stage process. The composer or songwriter creates the work but it doesn’t exist until it’s performed. In many ways, that’s how photography is. Until you make that print then you haven’t revealed its life to the world. You can go out and have the experience and make the picture, which matters. Then there’s the performance and Ansel Adams himself said: “The negative is the score and the print is the performance”. Since we have got Charles Cramer's pictures behind us and Charlie was a good friend of Ansel, it’s appropriate. I think we see that it also enables you to think to have the idea on one hand but then have to translate it. At both stages, both at the seeing, thinking, feeling and the craft side making the picture you have to put yourself into it and then you have another opportunity to express more accurately or more decisively what you’ve seen at the print stage. That was certainly true for all those great darkroom printers and it was very difficult in colour up until quite recently. Now it’s opening up amazingly because of new technology. Tim: I was going to ask you a question which is, a few of the pictures in the exhibition you’ve rescanned, reprocessed and printed for this exhibition. I’m interested in how you felt about that and did you find yourself wanting to process them differently than they were in the book? Joe: Yes! Very much so. It’s was a pressured test, Tim, thanks for that! Of the ones we ended up choosing, I was fairly happy with them in their own way. They reflected back to me something about myself and how I’ve changed as well. I like to think I’m a better printer, I wasn’t a printer then. I was used to doing some repro but I was not a colour printer. I was shooting to get it right in camera. Because if any of you don't remember that far back or weren't a professional photographer, you took your transparency, in the so-called ‘good old days’ and send it off to your client or repro house and they often murdered it. They then covered it in oil and dust, that’s how it came back anyway. Some of those repro guys were very good. But what they were trying to do was reproduce the transparency. What you were looking at was both the good and bad aspects of the transparency. So what we were essentially trying to do as colour photographers in the 80s and 90s was to make something that was perfect in camera. With the best will in the world, that is a very difficult ask. Certainly, Ansel Adams and Edward Weston and the great masters black and white would never have thought that was their obligation to create the perfect negative. Which you could put down on paper and print it. They would have done lots of dodging and burning, multi-stage split toning and contrast control, all of those things. In some respects what you see in the original book is an honest attempt more or less to reproduce the transparency and in many cases, I can tell you they aren’t very accurate. Not only are they limited by everything I’ve just said, but not that well reproduced. There’s a big difference between a transparency and four colour CMYK, especially with the blues. So the Contours in Blue, that print of the beach in Dunraven Bay is a mile off what the transparency. Tim: We do have two copies of First Light, one is in Polish version and the other English, if you want to compare what’s in the book, with what’s on the page to see just how accurate it is. Joe: It is interesting, the scans - Although they’d be even better if I’d got you to scan them Tim, I scanned them at home - I then used Photoshop to rebalance the colour where needed and maybe draw out a bit of shadow detail in one or two places and look at the overall balance. Now, for instance, I always analyse my pictures by inverting them on the screen to understand the flow better, the abstracted flow of the picture, and the life force within it. Then I’ll change areas in terms of light and dark, occasionally I’ll desaturate areas which are too demanding and occasionally bring in little a bit of saturation out to others. It’s usually a multi-stage process, so I very rarely make a scan, clean the dust and print it. I will do those first things, clean the dust, do my first basic curve adjustments and then leave it and come back to it a day later to do some more and come back to it a week later and do a bit more, then I’ll do the print. That way you get a more nuanced interpretation of the original, but the idea, for me is, the light remains at a primary life force of the picture. Tim: Would it be safe to say that the book is a testament to a moment, that era of photography and to the equipment you used at the time? Joe: You could say that and I continued to use that large format 5x4 camera up until Scotlands Mountains, so two books down the road as it were. Then I pretty much changed as I realised that at one point I was trying to shot 5x4 large format and medium format digital alongside, which apart from breaking your back, you get distracted. You need to concentrate so I did change but in a way it represents that and certainly First Light is a dedication to that type of workflow. I think in the back I write about how the dedication of film remains as I saw it as the benchmark of what you can do in real terms of quality out in the field. None of that has changed, but what has happened is that digital capture has improved beyond recognition in the meantime. Tim: Were you using large format Julian presumably? Tim: Harvey, you were using 35mm? Harvey: Never been anywhere near large format! Tim: Matt you’ve just started large format? Tim: Over a decade later you’ve influenced someone else to pick up large format as well Joe! So Matt tell me why you started large format? Matt: I’m not quite sure Tim, to be quite honest. I like the idea of the whole process, to slow yourself down, to take more time over the finding of your composition. It’s a lot slower process and there is more thought involved. That’s the part I enjoy, going out finding the compositions, finding these pictures, and spending the time making these pictures correct. It really appealed and it doesn’t help when I come to your place and see things on light tables. It was inevitable really, just to learn the craft and it feeds back really towards the book, as it still has relevance personally for me today, because of the details in the back, of what film they were shot on, what filters may have used. I have now come to the conclusion I would like to go back to a lot of the locations I’ve shot digitally and over a period of time, reshoot them on 5x4 film, because I’m a bit daft and it’s hard! That’s the honest explanation! Tim: You like a challenge Baxter? Baxter: It was the challenge that got me into it. My father in law had read about the Gandolfi Brothers in the Sunday Times about their cameras and he said to them, I’d quite like one of your cameras and they said if you pay a deposit and wait two years we’ll let you know when it’s ready. So he bought this camera and went to pick it up from Peckham, as that’s where they are in a garage, and it sat upstairs. We were in York and he said I’ve got this 5x4 Bax. So we went down to Jessops and they had some HP5 and had a checklist of things to go through. End of the weekend he said, why don’t you borrow it, as he’d had some abject failures. I read a bit more and (this was preceding going on the course with Joe) and we went to the Lakes for New Year and there was pristine snow in Wastwater and about a three-mile walk in with a Bronica, which I’d only just started using, and this Gandolphi. I set it all up and it was like something I’d never seen before. For one I discovered that Blutack doesn’t stick filters in place in those conditions! I hadn’t loaded the film into the dark slides properly and there’s a guillotine in the film which popped forward, so all the best light drifted off with me cursing an awful lot and trying to use this thing, it would have made a very funny video. I took a couple of shots on the Bronica, which came out really quite nicely, and at that point, I thought, I need some tuition and so got on Joe’s course. It was the challenge initially that this bit of wood, leather and brass wasn’t going to beat me. It was a technical challenge, then all of a sudden I found that it was the slowness and contemplation, and occasionally a bit of swearing that got me succeeding. There was something about the aesthetic of the images that you produce, even the ones which weren’t quite right, you knew you’d done something. That you can control the perspective, the tilt on and get things absolutely right and do things you couldn’t do with a more conventional camera, that’s what got me on that pathway. Something that came in earlier in the conversation, I think some of the best photos that you see them and are dead obvious, those moments are rare, but generally, those are the ones which really just happen for me. There are other ones, where I’ve done all the problem solving and you look at it and it ticks all the boxes but there’s something missing, and you’ve worked too hard to in order to make compromises or whatever it is, solve too many problems that it leaves it a bit sterile. There’s a lot to be said for spontaneity, which sometimes you do get on your phone or whatever else. The bottom line is using the camera like that and the craft that is seen in First Light, it’s amazing. Tim: Thanks Bax. Any questions from the audience? Audience Member: Let’s say you were doing a new book called Second Light. What would be different? Joe: Very interesting question. It would be easier to say what would be the same initially, which would be the craft remains a fundamental of art, but what I mean by that is, that I’m lucky enough to have friends who are painters, musicians, and the odd poet and the thing which is surprising is that when you get chatting to other artists, they are not all head in the sky dreamers. They are actually hard working, analytical, rational thinkers who craft their work and they allow their more personal experience emerge through their work. They won’t necessarily talk about that but they can talk about and share is some of the process. Actually, the mysterious aspects are very difficult to describe, and may by they are beyond description, maybe that’s why we need to use a photograph. So the craft side would probably remain as an important part of it. What I would like to do more of, I think, having reread bits of First Light, is to put landscape photography into a slightly wider context philosophically, so that it ripples out a bit more, more outward looking than the original book. It is concerned with the pictures of all, and I think as time has gone by, I’ve tried to understand why do we do what we do, and I know many people in this room who have jobs that if I compare to what I do are more important than I do, because it’s about saving people’s lives and teaching young people, those really core jobs. What I do is wander about taking pictures, that’s an unimportant job in lots of ways, but I do know that from conversations that I have with many people about how landscape photography and photography and the experience of being in nature influences their life and enriches the quality of it, the kind of reconnecting with the natural world that this process is important and significant. I probably don’t mention that in First Light, probably because it wasn’t something that was on my agenda at the time, whereas it has so now. So I’d like to weave that story in more. Audience Member: One thing that’s changed from your reprographic use of transparencies being translated to as you print each page which wasn’t available then was local adjustments. I’ve recently reread all the Ansel Adams books on technique and I was actually quite surprised that I knew he managed dynamic range both at the negative and print stage by choice of exposure and choice of developer, that sort of thing. But I hadn't realised quite just how much local adjustment he did. I’m thinking about his large format enlarger with different bulbs he could put in and take out. But that’s something we do routinely. Joe: Just to check that everyone can hear at the back. The question was, in the dark room, Ansel Adams is a good example and probably the best-known example of how it’s possible to use local adjustments to fundamentally tune the image to a point of perfection. Now we have that process available, whether if that’s through Photoshop or a raw developer like Lightroom, which makes it very easy to do it. Doing it properly is the hard part. You’re right, and I see that very much that local adjustments are really where you identify or re-identify your voice. How you manage local adjustments speaks of how you see light and form and that’s fundamental. You cannot do refined work in global adjustments alone. Audience Member: Did you use any local adjustments when you rescanned and printed? Joe: I sure did. I can talk about them if you like? Some of them are very subtle if you look a the Elgol picture as an example. If you look at the foreground, and I think I might have done a little too much there, I’ve drawn out more modelling in the rock to create a more three-dimensional sense of the foreground, and I’ve pushed the background further back by tweaking the light in there. If we take the case of Contours in Blue, the background is actually very slightly softened and the foreground is sharpened and there’s a gradient between them. I’ve basically tried to increase it. It’s very subtle, it’s a small adjustment but these are two local adjustments intersecting. So that there’s an enhanced sense of depth to the image and also the yellows in it, I remember being incredibly vivid on the day. The yellow against the blue light, I’ve tuned them to how I believe they were, whether they were or not nobody can prove, but that’s how I remember it, and certainly, if you look at the original reproduction it’s not how it looks, unfortunately. Hope that makes the point. Audience Member: You spoke about having to everything in the camera when you were working on film, with very little opportunity to do anything thereafter. Now, what proportion of the final image is the original shot and what proportion is the edit? Joe: I’ll try to precis that, what proportion is what is captured I camera and what’s the final edit? That’s a how long is a piece of string question, so forgive me for saying that. The fact is the composition is established in camera. To me, that’s, I won’t say that’s sacrosanct like I’d never crop or anything but if you don’t the proportions and overall relationships in the picture are fundamental. If I were to make a print, that’s a straight print and then the print that’s the final version, you most certainly would see the difference. You could say that the original if should be, a good picture. If it’s not a good picture then I shouldn’t be working on it to a final print. Do you see what I mean? What you’ll see is refinements and tweaks of colour, and tonal relationships to essentially create more depth and better balance and usually a more active flow around the image. Audience Member: One of the things which have changed since the book came out is that we’re bombarded with landscape images. Going back to the inspiration/influence discussion earlier, one of the challenges to me seems to be cliché these days, because we’ve seen everything before more or less. I wondered if you had any comment on that and how to avoid a cliché. Joe: Avoiding a cliché, I think the most important thing is to try to speak with your own voice. It doesn’t matter if the subject matter is well known but I think that the difficulty is, that if you put “I must avoid a cliché” as a primary objective, then it feels like you’re putting the cart slightly before the horse. Although I totally understand what you’re saying and I think everyone here has a voice and they follow your own path. What’s everyone’s view on that? Harvey: I find it an interesting challenge as I’ve been to a few of these iconic locations over the years now, Elgol for example, and I take it as a personal fun challenge, other people might not find it so fun to try and avoid all the obvious shots the cliché one. It’s a challenge to myself. Tim: Like finding a novel take on an existing location that’s well recognised. Harvey: Yes, the starting point is quite often that’s the view you’ve seen many times in magazines and on the web. Right, I’ll go that way instead…..as a deliberate attempt to avoid it. Joe: I have a slightly different background in some respects as I still had to make a living as a photographer. Harvey: Good point, I don’t! Joe: When I went to do travel photography, to me this is quite interesting because I totally understand the fear of the cliché. When I was going guide books and travel books, my publishing client wanted me to photograph clichés. But I didn’t want to photograph clichés. For example, what happens when you get to somewhere like Mont Saint-Michel which is one of the biggest tourist destinations in Europe, I have been lucky enough to be there on a few occasions and I love it. I explored all the way round on the causeway in the low tide area trying to find different compositions but actually, the best picture I took of Mont Saint-Michel was an absolutely frame filling long lens picture of the mount with a reflection and a storm happening behind it. It was the light which transformed it on that day and it felt like my picture. I didn’t mind, it was what it was. It was quite clearly Mont Saint-Michel, you wouldn’t mistake it for anything else. At least it had been translated in a way that had a very transient lighting, and the lighting for me brought out the magic and the kind of drama of this great historical location. I also strongly believe that every generation has to rediscover the landscape. So for example, whenever I do talks in Scotland and I show the images of Buachaille Etive Moor, there’s always some wag in the audience who says that old cliché! I was thinking it wasn’t a cliché to me when I first saw it! As when I first saw it I had never seen a picture of it. That’s literally true. I’d say there are two approaches and one is to tackle well-known locations and try to make them your own in whatever way you feel. The other is to keep looking for the new, after all, the truth is there is still millions of places, scenes and angles that have never been photographed. Tim: It’s worth referring to music as a reference or metaphor for this, as in the world of music, as I’ve chatted with loads of musicians, when I’ve been in bands. They all sit-down at some point and ask themselves "what can do that’s not been done before" and reach the conclusion that it’s impossible. Yet a new genre comes out every year or a new style of music. They are mélanges of everything that’s gone before, with a new person doing it and a new take on lyrics or sounds, but they fundamentally are working on the foundations of every artist that has gone before. Joe: It’s a performance as well, which is slightly different admittedly. I love this story, my mum many years ago asked her aunt if she liked to accompany her and my father to a concert. She said it’s going to be Beethoven’s 5th and her aunt said I’ve heard it before and declined. We shouldn’t become a victim of cynicism as it were. Audience Member: How many of the panel might have been influenced or inspired if Joe’s book had been a digital book originally? If they hadn’t actually seen a physical photography of the book would that have affected their thinking? I put it down to my age that the fact that I don’t get the same inspiration or influence by looking at a digital image. If I was Ansel Adams I would call that a negative instead of a print. If I go to a gallery I can be inspired or see a book I can be inspired but I can’t be inspired by digital images. Harvey: I’ve been inspired by individual images I’ve seen on the web. Tim: I’ve got William Neill’s books that he’s done digitally which I’ve been inspired by. Do you look at On Landscape possibly? Joe: It’s more of a kind of how much can you spend with a picture as part of it and I think if this is what you’re saying Rod, that to me pictures on paper do have a presence that a screen image doesn’t have. I know when we all print, I’m sure that everybody here has printed here and had success or had a print come back from a lab that they really loved. It’s often a surprise by how much presence a paper print has compared to a screen image, which is should have, but that goes without saying. Audience Member: One for all the panel, if you doesn’t matter if you capture the image on film or digitally, when you get to post production. Do the members of the panel see that part as corrective or creative. Harvey: At the moment I don’t do much post production because Iif I’ve got the free time to dedicate to photography, I prefer to go up a mountain than sit in front of a computer screen. So I guess I would see it as creative on top of instead of correcting. I try and take images out of the camera that I like and I believe most of them could be improved upon creatively post production but I’d consider it as an extra creative step on top of, rather than creatively correcting errors. Beata: I think it’s a necessity nowadays to put a lot of work in post processing. Probably the creative part for me is cropping the image as a lot of my images are cropped into squares. That is very creative as I choose intentionally which part of the image I am going to get rid of and sometimes what I have in mind when I’m shooting isn’t necessarily the same when I start cropping, which is a bit bizarre but it happens quite often. All the other one is the technical and is basically trying to correct what the camera cannot cope with like dynamic range – sometimes I have to put the layers but I wouldn’t call that creative it’s more like a technical part. Baxter: When I was shooting film the colour was largely corrective but the black and white film was more creative in that I was doing black and white dark room and darkening areas/sections to bring out different things. I would like to be more creative with my digital processing as sometimes I get blocks and just sit there and don’t do anything with them and leave them and come back to them. The other thing about digital is that your raw files, they improve over time, they do!, as they bring out new generations of software that you get more shadow detail so you can do things with your adjustments you couldn’t do before or in terms of changing your white balance or you can modify if it’s a straight or grad. It’s amazing if you go back with some of them you can actually things you didn’t do. You’ve done nothing, they’ve just sat there and it’s a good job you didn’t throw them away because sometimes you see ones that you wish you’d just done a little bit differently and it’s immediately obvious what you need to do, like the cropping can come in. I see some people who have had fantastic exponents, such as David Baker does some really creative things with seascapes and use of waves which has been successful. We both went to Mupe and shot a fantastic storm in 2014 and I just didn’t have that extra dimension to the way I saw things than David’s done and he’s had tremendous success with those images. Tim: Julian, you’ve done a bit of post processing now and again! Julian: Just a little bit! I see it as mostly creative. With commercial work, it can be corrective as you’ve getting rid of things or adding things compositing. But with the landscape work, I’m just playing with a single file, I see it totally as creatively. I see it as no different to darkroom work and I hate it when people go ‘it’s been photoshopped’ because it requires skill and control to do a good job. It’s a creative process apart from spotting dust and for me, it’s an enjoyable part of the process. Matt: Definitely creative, certainly with digital. When you open up your raw files the picture’s there or not if you know what I mean. It’s either a good picture which means you’re going to try and enhance it and be creative with it or if it’s failed, it’s failed. I tried to get everything right in camera with the use of grads, shot off a tripod and get everything as correct as I possibly can at the point of capture as I’m not a fan of doing a lot of editing as I don’t like being in front of a computer. To open up the raw file as we all know, raw files are flat so they are going to need a bit of a boost or lift and I see that as creative to get the best image from that individual file. Secondly, what do you remember seeing often not the same as you saw! Thirdly how do you interpret that memory and then how do you feed in your personal view and lifetime experience of being outdoors and view of colour, texture and form will result from that. Finally, the picture itself will have a life of its own and it will feed back to you the adjustments that need to be made. To me those last stages are creative but the corrective part is to say that the raw file needs to be tuned so it looks three dimensional as the scene that was in front of you because it won’t do when you initial open the file. Whereas a film or transparency image basically has built in curves, so you’re doing much, much less. Julian: And how you were feeling when you were standing there as well is massively important. Joe: Did you feel warm about it, or cold is an obvious way of thinking about it. Or is the impression in your memory or mind or emotion is it a dark one or is it a light one? Is it purely balanced or neutral? Have a look at Julian’s prints as you’ll get some dark imagery and some are lighter in mood, so that’s the artistic side. Tim: I’d like to thank our panel and Joe for coming in and speaking some fantastic words on photography and influence. Big thank you for everybody. 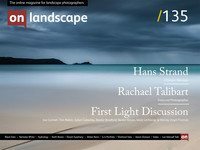 The On Landscape II exhibition celebrates the inspirational elements that stimulate our chosen photographers creativity when making their images. We hope that you too are inspired! We would love you to get creative and share your images with us. Include images of your visit to the exhibition and of your own inspired landscape photographs, using the hashtag #firstlightinspired. There are 3 annual subscriptions to On Landscape to be won for those we like best.